Dancefloor generates electricity at London’s first eco-disco! Sustainability got sexier last week as Coldcut and Jade Jagger hosted the opening of Surya in King’s Cross. The Club4Climate project is London’s first taste of eco-friendly clubbing, making clubbers happy in the knowledge that their organic beverage-induced booty shaking can generate 60% of the energy needed to run the club. The venue’s most exciting innovation is the piezoelectric dancefloor, which uses quartz crystals and ceramics to turn clubbers’ movement into electricity! Previously seen in the Sustainable Dance Club in Rotterdam, this is Britain’s first exposure to such technology. The rest of the power needed will come from a wind turbine and solar energy system, with any surplus used to power private homes in the area. The club will also be installing the latest air flush, waterless urinals, low flush toilets and automatic taps to ensure maximum water saving plus less greedy air conditioning units. The project is clearly trying to affect behavior on a much wider scale, too, requiring patrons to sign a 10-point manifesto on entry, giving free entry to anyone who can prove that they walked or cycled to the venue, and encouraging as many other clubs as possible to adopt his philosophy. Property developer Andrew Charalambous is behind Club4Climate, appearing in character as ‘Dr Earth‘ to be more down with the kids. He says the club aims to ‘stop preaching to people and use an inclusive philosophy to create the revolution [needed] to combat climate change.’ A Club4Climate island is also planned for 2010, although how clubbers will transport themselves to the island hasn’t been mentioned. Hello, Our names are Carson Stanton and Rosie Sullivan. We are from Farnsley Middle School. We are really interested in what you are doing with Piezoelectricity. We are, in fact, writing an article about it for scijourner.org which is sponsored by the National Science Foundation. May we ask you some questions? The questions I would like to know are: Can piezoelectricity be used in other places or situations? Did you build the floor yourself or did you order it? How does the tool vibrate to create electricity? Do you think more places should have piezoelectricity? Thank you for your time. Sincerely, Rosie Sullivan and Carson Stanton. Dancefloor generates electricity at London's first eco-disco! Sustainability got sexier last week as Coldcut and Jade Jagger hosted the opening of Surya in King's Cross. 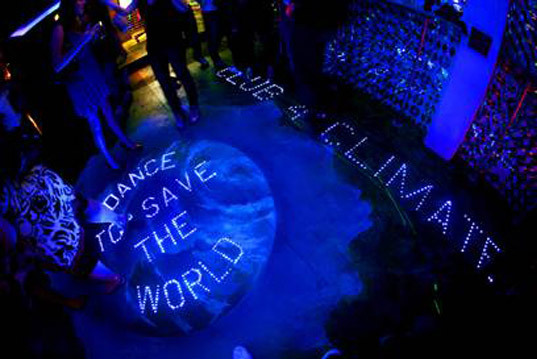 The Club4Climate project is London's first taste of eco-friendly clubbing, making clubbers happy in the knowledge that their organic beverage-induced booty shaking can generate 60% of the energy needed to run the club. 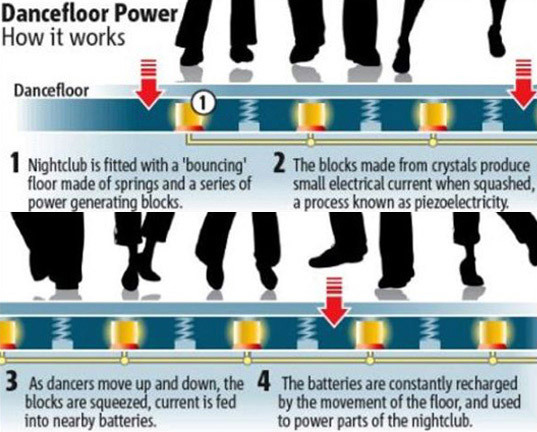 The venue's most exciting innovation is the piezoelectric dancefloor, which uses quartz crystals and ceramics to turn clubbers' movement into electricity!